Learn from The Maine Sea Kitchen (Great Food and Products with a Hint of the Sea) why you should be buying your Sea Vegetables from Maine, read a blog about cooking with Maine Seaweed, and be sure to check out a book about good nutrition and how it affects our bodies, "How to Eat Healthier to Keep the Doctor Away". Many people were shocked to hear that seaweed may be the next big thing. But here at VitaminSea Seaweed, we have known about the benefits of seaweed for a long time. Consider the healing benefits that the ocean provides for so many ailments. The ocean is packed full of vitamins and micro-nutrients, and all of these are absorbed by seaweed making it one of the healthiest plants in the world! 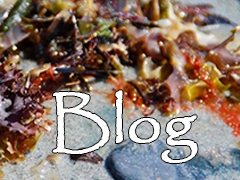 The healing properties and benefits of seaweed are astonishing! Every spring millions of people turn to diets and exercise to shed those extra pounds that were packed on over a long winter. Every diet takes motivation and dedication in order to work, and eating right is a must in order to manage your weight. It’s easy enough to go to the store and grab the diet pills that say they allow you to eat what ever you want, and still lose the weight. Well if only those pills worked without any side effects. There is a natural alternative. It will not replace going to the gym and should be consumed along with a well balanced diet. Of course I am speaking of seaweed. The natural plant that gathers its nutrients from the seawater in which it grows and needs only sun light. So how does a seaweed diet help you shed those pesky pounds?